For nails and fasteners that are “built to work” construction workers, professional woodworkers and hobbyists turn to the durable, innovative products of Stanley-Bostitch. Stanley-Bostitch manufactures top-quality, innovative fastening tools and fasteners for industrial, construction and home improvement applications. The principal brands that they manufacture their products under include Stanley, Bostitch, Hartco and Spenax. Stanley-Bostitch product lines include pneumatic nailers & staplers, fasteners, compressors, office products, and related accessories for market segments including commercial/residential construction, manufactured housing, manufactured furniture/bedding, professional woodworking, sophisticated hobbyists, and office workers everywhere. A subsidiary of The Stanley Works (NYSE: SWK), the company is headquartered in East Greenwich, RI, Stanley-Bostitch operates multiple manufacturing facilities throughout the globe. 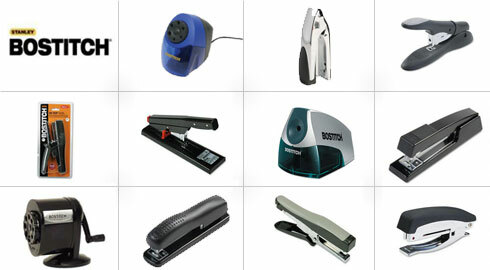 Browse our extensive selection of Stanley-Bostitch tools and products and get FREE shipping on our top-selling items. Remember, if you find any of our in-stock Stanley-Bostitch at a lower price anywhere else online, we’ll match that price plus 10%! Stanley Bostitch 30455 Tape Rule 25ftx1"
Stanley Bostitch Black 8 Hole Manual Pencil Sharpener, 2 1/2" x 5 1/2" x 4 1/4"